Background: This study aimed to compare the effects of different depths of sedation during total intravenous anesthesia (TIVA) with remifentanil and propofol given by target-controlled infusion (TCI) on postoperative cognitive function in young and middle-aged patients undergoing gynecological laparoscopic surgery. Materials and Methods: A total of 150 American Society of Anesthesiologists physical Status I/II patients scheduled for gynecological laparoscopic operation were randomly divided into three groups. Anesthesia was maintained with intravenous infusion of TCI propofol and remifentanil, intermittent injected intravenously with rocuronium. The infusion concentration of propofol and remifentanil was adjusted to maintain bispectral index (BIS) at 30 < BIS ≤ 40 in the first group, 40 < BIS ≤ 50 in the second group, and 50 < BIS ≤ 60 in the third group. Mini-mental state examination (MMSE) and trail-making test (TMT) were used to assess the cognitive function one day preoperatively and one day postoperatively. Results: MMSE scores were > 24 sores on the day before anesthesia and the day after surgery in all three groups. However, the first group had the significantly higher MMSE scores than the other two groups after surgery (P < 0.05). Compared with that before anesthesia, TMT completion time was shorter on the day after surgery in the first group, while prolonged in the third group (P < 0.05). The first group had the significantly lower TMT completion time than the other two groups (P < 0.05). Conclusion: The depth of sedation, 30 < BIS value ≤ 40, under TIVA with remifentanil and propofol given by TCI had the minimal influence on postoperative cognitive function. Postoperative cognitive dysfunction (POCD) is a recognized clinical phenomenon after surgeries and anesthesia, characterized by impaired consciousness and disordered thinking. POCD could cause a decline in the activities performance of daily living for elderly surgical patients, and then cause great economic burden for individual, family, and society. Although the specific causes for POCD are not identified, these factors might be the possible contributing factors including patient age, education, anesthetic depth, and cerebral effects of anesthesia. , POCD is a transient disturbance, which could affect patients with any age. However, many studies indicated that young patients are at lower risk of developing POCD than elderly patients. ,,] About 40% of patients over age sixty developed POCD after surgery, and 10% had POCD after 3 months. Cognitive changes will decrease the postoperative life quality and increase the surgical morbidity of these patients. It is still unclear about the optimal treatment of POCD, and the prevention seems to be the best choice. Up to now, many surgical and anesthetic techniques have been developed to prevent POCD, but there is no agreement about the efficiency of prophylactic neuroprotectants. Rundshagen suggested that providing adequate oxygen during surgery for all vital organs would be helpful to avoid the postoperative cerebral dysfunction. Longitudinal study indicated that using the tight intraoperative management of homeostasis to balance the fluid, blood glucose, and electrolyte in patients could be effective on preventing POCD. Chan et al. reported that bispectral index (BIS)-guided anesthesia could decrease the postoperative cognitive decline. In general, the previous findings on this issue are not consistent, and it is not yet possible to obtain a conclusive assessment. Many of the previous studies focused on POCD after cardiac surgery, but the findings of Evered et al. showed that noncardiac surgery, even minor noninvasive procedures under sedation, was also associated with POCD. Shu et al. 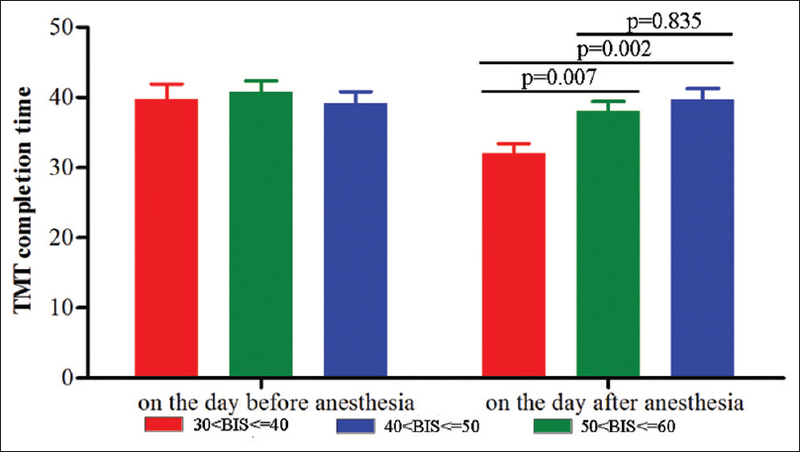 reported that maintained the BIS in the 40-50 range during the combined intravenous-inhalational anesthesia yielded milder influence on postoperative cognitive function after gynecologic laparoscopic operation. In this study, we recruited young and middle-aged patients scheduled for gynecological laparoscopic surgery to compare the effects of different depths of sedation during the total intravenous anesthesia (TIVA) with remifentanil and propofol given by target-controlled infusion (TCI) on postoperative cognitive function. This study was approved by the Ethics Committee of Department of Anesthesiology, First Hospital, Zhejiang University, and all patients provided the written informed consent before the study. Patients had to meet the following inclusion criteria: The age was between 18 and 60 years old; the mini-mental state examination (MMSE) score was more than 24 before surgery; the number of years in school was 9 years or more; no opioid or antipsychotic drugs was used recently; no history of neurological and psychotic disorders, diabetes mellitus, severe hepatic/renal dysfunction, and severe hypertension; no history of alcohol or drug abuse. Meanwhile, patients unwilling to comply with the procedures were excluded from the study. All patients were under the American Society of Anesthesiologists (ASA) physical Status I or II. Patients were randomly allocated to three groups using the random number table. All patients were anesthetized using the same procedure. Anesthesia was induced with sufentanil (2-3 μg/kg, Hubei RenFu Pharmaceutical Company, China), midazolam (0.2-0.4 mg/kg, Jiangsu EnHua Pharmaceutical Company, China), and propofol (5 μg/ml, TCI, Xian LiBang Pharmaceutical Company, China). Anesthesia was maintained by the TIVA with remifentanil (0.1-0.15 μg/kg/min, Hubei RenFu Pharmaceutical Company, China) and propofol (2-4.5 μg/ml) by TCI. During the anesthesia, the blood concentration of remifentanil and propofol was regulated to control the depth of sedation. The depth of sedation was maintained to achieve a BIS (Aspect Medical Systems, Inc.,) score of 30-40 in the first group, 40-50 in the second group, and 50-60 in the third group. Rocuronium bromide injection (0.6 mg/kg, N.V. Organon, the Netherlands) was used to maintain muscle relaxant. The heart rate, electrocardiography, respiratory rate, systolic blood pressure, pulse oximetry, hemoglobin oxygen saturation, and end-tidal CO 2 partial pressure were continuously monitored during the whole process. We did not use the muscle relaxant antagonists. If postoperative pain was obvious, then 0.2 g compound aminophenazone and barbital injection (Xian LiJun Pharmaceutical Company, China) was used by intramuscular injection. Cognitive function was evaluated one day preoperatively and one day postoperatively in a quiet place with only one patient and the experienced psychometrician each time. Both the rate and patient were blinded to the treatment methods and groups. We used the sequentially numbered, opaque, sealed envelopes to conduct allocation concealment and blind outcome assessment. Usually, using several scales to assess cognitive function at the same time could increase the sensitivity, but it needs more testing time, which will easily result in fatigue for patients and then increase the false negative rate. Therefore, in this study, the MMSE  and trail-making test (TMT)  were used to assess cognitive function. These two scales were validity and reliability for cognitive function. ,, The MMSE score was the primary outcome, and the TMT completion time was the secondary outcome. The psychometrician trained in MMSE and TMT collected, scored, and interpreted the data. All measurement data were expressed as the means ± standard deviation. The intergroup data were analyzed using the student's or pair t-test. The intragroup numerical data were analyzed using one-way analysis of variance; if significantly difference existed, then according to the equal variance criterion, the Tukey or Bonferroni post hoc analysis was performed to determine which two groups differed significantly. The two-way ANOVA was used to check interaction of groups and different depth of sedation. The intragroup nominal data were analyzed using Chi-square test. We used the intention-to-treat analysis in this study. The P < 0.5 was used to determine statistically significant difference. SPSS version 19.0 (IBM Analytics, Armonk, New York, USA) was used to conduct all statistical tests. A total of 166 ASA physical Status I or II patients were included in the study. These patients were aged between 21 and 57 years old and scheduled for gynecological laparoscopic surgery from June 2012 to August 2015. At first, there were 54 in the first group, 57 in the second group, and 55 in the third group. However, after surgery, sixteen patients (three, first group; six, second group; seven, third group) were excluded because of their refusal to cognitive function evaluation. Thus, 150 patients were left to complete the neurocognitive tests. There were no statistically significant differences in age, body mass index, ASA classification, education level, and hospital stay and operation time among the groups (P > 0.05). The detailed information of these patients was presented in [Table 1]. The flow diagram of this study was showed in [Figure 1]. MMSE was performed at one day preoperatively and one day postoperatively. The preoperative MMSE scores in three groups were no statistically significant difference (P = 0.41, power = 0.89). There was no obvious correlation between the basic demographic data and the result of MMSE score including age (r = 0.14, P = 0.57), BMI (r = 0.09, P = 0.71), education (r = 0.11, P = 0.48), and surgery time (r = 0.17, P = 0.42). The score of MMSE in all patients was still more than 24 after surgery. Compared with the preoperative MMSE scores, those on the day after surgery were nonsignificantly decreased in three groups (P = 0.24, power = 0.85). However, the average MMSE scores in the second and third group had a greater reduction than the first group. The average MMSE score in the first group was significantly higher than those in the other two groups after surgery (P = 0.02), and the difference of MMSE scores after surgery between the second and third group was not statistically significant [P = 0.38, power = 0.88, [Figure 2]]. TMT was performed at one day preoperatively and one day postoperatively. The preoperative TMT completion time in three groups were no statistically significant difference (P = 0.50, power = 0.86). There was no obvious correlation between the basic demographic data and the result of TMT score including age (r = 0.21, P = 0.42), BMI (r = 0.15, P = 0.39), education (r = 0.10, P = 0.44), and surgery time (r = 0.18, P = 0.57). Compared with the preoperative TMT completion time, those on the day after surgery were nonsignificantly increased in the third group, whereas decreased in the first and second group. The average TMT completion time in the first group was significantly lower than those in the other two groups after surgery (P = 0.01). There was no statistically significant difference of TMT completion time between the second and third group after surgery [P = 0.42, power = 0.84, [Figure 3]]. Currently, no "gold standard" was identified to diagnose POCD. Both MMSE and TMT were recommended by the International Study of postoperative cognitive dysfunction to assess the cognitive function. The MMSE had a good sensitivity and was easily to operate,  and TMT could assess several aspects: Visual attention, visuospatial abilities, task-switching, and psychomotor processing speed. Compared to MMSE, the TMT might be more appropriate for female. Before the experiment, all patients obtained some relative training to make sure that they could successfully complete the MMSE and TMT. In this study, we found that during TIVA with remifentanil and propofol given by TCI, the MMSE score of all patients was still more than 24 on the day after surgery, which indicated that no one experienced POCD. However, this result could not demonstrate that no transient cognitive impairment was occurred. Actually, we found that the average MMSE score on the day after surgery was nonsignificantly decreased in three groups, which suggested that there might be transient cognitive impairment. Meanwhile, the average MMSE score in the first group was significantly higher than those in the other two groups after surgery. Usually, compared with the TMT completion time in the first time, in the second time, it should be decreased after learning and memory. However, here, we found that the average TMT completion time in the third group was not decreased, even a slight increased. The average TMT completion time in the first group was decreased and significantly lower than those in the other two groups after surgery. There was no obvious correlation between the result of TMT and MMSE. These results indicated that during the TIVA with remifentanil and propofol given by TCI, maintained the BIS of young and middle-aged laparoscopic patients in the 30-40 range yielded a minimal influence on postoperative cognitive function. However, one thing should be noticed: Whether the statistical difference here was clinical difference or not needed future studies to further investigate. Our results were different with the results reported by Shu et al. that maintained the BIS in the 40-50 range resulted in minimal impact on postoperative cognitive function after gynecologic laparoscopic operation. Two reasons might be responsible for such phenomenon: (1) We used the different types of anesthesia-intravenous - inhalational anesthesia versus TIVA; (2) we used the different drug to maintain BIS - remifentanil and sevoflurane versus remifentanil and propofol. Therefore, our results could enrich the choice of clinicians in clinical practice. Sodium thiopental had been largely replaced by propofol for the induction of anesthesia, for its more rapid and "clear" recovery. Several mechanisms of anesthesia reported that propofol could potentiate the activity of gamma-aminobutyric acid receptor, and then slow the channel-closing time. , Furthermore, propofol could act as a sodium channel blocker. Fowler reported that endocannabinoid system might significantly contribute to propofol's anesthetic action. Previous study indicated that surgery-induced tissue damage could activate the peripheral innate immune system, and then lead to the exaggerated release of inflammatory cytokines, which could impair postoperative cognitive function. Researchers suggested that propofol could inhibit the release of pro-inflammatory cytokines and produce an improvement effect on postoperative cognitive function in the early stage after surgery. , Due to the lower BIS value indicated the more depth of sedation, and the more depth of sedation needed more propofol;  then in this study, the depth of sedation in the first group (BIS, 30-40) was the deepest, which indicated that the dosage of propofol in this group was the maximum. Therefore, the minimal influence on the postoperative cognitive function in this group suggested that propofol might be able to inhibit the inflammatory response in central nervous system and improve POCD. Remifentanil, as a new potent synthetic opioid analgesic drug, had the following characteristics: decomposition by plasma and tissue esterase, which was not affected by the liver/kidney function; short-acting; good controllability; rapid onset of action; rapid clearance; no accumulation with continuous infusion; easily control the dose. In this study, the operative time was short and the dosage of remifentanil was relatively small. Therefore, whether the remifentanil was relative with POCD needed future study to further investigate. This study certainly had some limitations. First, we only recruited about fifty patients in each group. The relatively small samples might weaken our conclusion. Second, only the postoperative cognitive function in the early stage after surgery was assessed. Whether the conclusion was appropriated for the mid-to-late postoperative period was unknown. Third, it could not be able to rule out the possibility that the other known or unknown perioperative factors, such as education level, might affect the conclusion. Therefore, our conclusion was still needed future larger scale clinical trials to verify and support. Through recruiting 166 ASA physical Status I or II patients scheduled for gynecological laparoscopic surgery to compare the effects of different depths of sedation during TIVA with remifentanil and propofol given by TCI on postoperative cognitive function, we found that the depth of sedation (30 < BIS value ≤ 40) had the minimal influence on postoperative cognitive function for young and middle-aged patients. Our conclusion was not influence by the basic demographic data including age, BMI, education, and surgery time. The subgroup analysis according to the ASA status found that the results were similar in the different ASA status. Our sincere gratitude is extended to the nurses and clinicians in the Department of Anesthesiology, First Hospital, Zhejiang University. DLZ contributed in the conception of the work, conducting the study, revising the draft, approval of the final version of the manuscript, and agreed for all aspects of the work. AQN contributed in the conception of the work, drafting and revising the draft, approval of the final version of the manuscript, and agreed for all aspects of the work. Chen K, Wei P, Zheng Q, Zhou J, Li J. Neuroprotective effects of intravenous lidocaine on early postoperative cognitive dysfunction in elderly patients following spine surgery. Med Sci Monit 2015;21:1402-7. O′Keeffe ST, Ní Chonchubhair A. Postoperative delirium in the elderly. Br J Anaesth 1994;73:673-87. Dodds C, Allison J. Postoperative cognitive deficit in the elderly surgical patient. Br J Anaesth 1998;81:449-62. Ritchie K, Polge C, de Roquefeuil G, Djakovic M, Ledesert B. Impact of anesthesia on the cognitive functioning of the elderly. Int Psychogeriatr 1997;9:309-26. Kotekar N, Kuruvilla CS, Murthy V. Post-operative cognitive dysfunction in the elderly: A prospective clinical study. Indian J Anaesth 2014;58:263-8. Brown EN, Purdon PL. The aging brain and anesthesia. Curr Opin Anaesthesiol 2013;26:414-9. Xu T, Bo L, Wang J, Zhao Z, Xu Z, Deng X, et al. Risk factors for early postoperative cognitive dysfunction after non-coronary bypass surgery in Chinese population. J Cardiothorac Surg 2013 1;8:204. Wang J, Su T, Liu Y, Yue Y, He R. Postoperative cognitive dysfunction is correlated with urine formaldehyde in elderly noncardiac surgical patients. Neurochem Res 2012;37:2125-34. Rundshagen I. Postoperative cognitive dysfunction. Dtsch Arztebl Int 2014;111:119-25. Puskas F, Grocott HP, White WD, Mathew JP, Newman MF, Bar-Yosef S. Intraoperative hyperglycemia and cognitive decline after CABG. Ann Thorac Surg 2007;84:1467-73. Chan MT, Cheng BC, Lee TM, Gin T; CODA Trial Group. 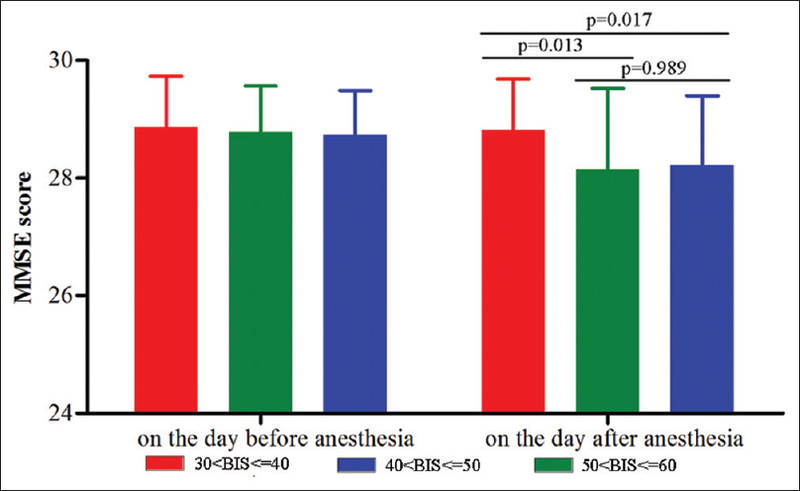 BIS-guided anesthesia decreases postoperative delirium and cognitive decline. J Neurosurg Anesthesiol 2013;25:33-42. Evered L, Scott DA, Silbert B, Maruff P. Postoperative cognitive dysfunction is independent of type of surgery and anesthetic. Anesth Analg 2011;112:1179-85. Shu AH, Wang Q, Chen XB. Effect of different depths of anesthesia on postoperative cognitive function in laparoscopic patients: A randomized clinical trial. Curr Med Res Opin 2015;31:1883-7. Silverstein JH, Timberger M, Reich DL, Uysal S. Central nervous system dysfunction after noncardiac surgery and anesthesia in the elderly. Anesthesiology 2007;106:622-8. Tombaugh TN, McIntyre NJ. The mini-mental state examination: A comprehensive review. J Am Geriatr Soc 1992;40:922-35. Hicks SL, Sharma R, Khan AN, Berna CM, Waldecker A, Talbot K, et al. An eye-tracking version of the trail-making test. PLoS One 2013;8:e84061. Ashendorf L, Jefferson AL, O′Connor MK, Chaisson C, Green RC, Stern RA. Trail making test errors in normal aging, mild cognitive impairment, and dementia. Arch Clin Neuropsychol 2008;23:129-37. Salavati P, Ramezani M, Monsef-Esfahani HR, Hajiaghaei R, Parsa M, Tavajohi S, et al. Neuroprotective effect of total and sequential extract of Scrophularia striata boiss. In rat cerebellar granule neurons following glutamate-induced neurotoxicity: An in vitro study. Iran J Pharm Res 2013;12:389-94. Fong TG, Fearing MA, Jones RN, Shi P, Marcantonio ER, Rudolph JL, et al. Telephone interview for cognitive status: Creating a crosswalk with the mini-mental state examination. Alzheimers Dement 2009;5:492-7. Miner JR, Burton JH. Clinical practice advisory: Emergency department procedural sedation with propofol. Ann Emerg Med 2007;50:182-7.e1. Krasowski MD, Jenkins A, Flood P, Kung AY, Hopfinger AJ, Harrison NL. General anesthetic potencies of a series of propofol analogs correlate with potency for potentiation of gamma-aminobutyric acid (GABA) current at the GABA (A) receptor but not with lipid solubility. J Pharmacol Exp Ther 2001;297:338-51. Hall AC, Turcotte CM, Betts BA, Yeung WY, Agyeman AS, Burk LA. Modulation of human GABAA and glycine receptor currents by menthol and related monoterpenoids. Eur J Pharmacol 2004;506:9-16. Haeseler G, Karst M, Foadi N, Gudehus S, Roeder A, Hecker H, et al. High-affinity blockade of voltage-operated skeletal muscle and neuronal sodium channels by halogenated propofol analogues. Br J Pharmacol 2008;155:265-75. Fowler CJ. Possible involvement of the endocannabinoid system in the actions of three clinically used drugs. Trends Pharmacol Sci 2004;25:59-61. Rosczyk HA, Sparkman NL, Johnson RW. Neuroinflammation and cognitive function in aged mice following minor surgery. Exp Gerontol 2008;43:840-6. Milligan ED, Sloane EM, Langer SJ, Cruz PE, Chacur M, Spataro L, et al. Controlling neuropathic pain by adeno-associated virus driven production of the anti-inflammatory cytokine, interleukin-10. Mol Pain 2005;1:9. Lin LY, Lin CZ. Effect of propofol on early postoperative cognition and inflammatory cytokines in elderly patients. Linchuang Mazui Xue Zazhi 2011;27:254-6. Henderson F, Absalom AR, Kenny GN. Patient-maintained propofol sedation: A follow up safety study using a modified system in volunteers. Anaesthesia 2002;57:387-90.